ARE YOU GETTING ENOUGH SON? If you live in a seasonable climate, you are probably loving the warm weather that May brings and the opportunity to soak up some vitamin D-filled sunshine. In college, we sun-worshipers called that “getting some ‘bennies’” (i.e., beneficial rays of the Sun). Little did I know back then that I would one day worship The Son and get way more benefits! Do you know that we English-speaking folks get the linguistic blessing of a terrific homonym? That’s right, because, as we will see from the Word, God metaphorically represents His “Son” in our immediate celestial universe by the “Sun.” Just as the Sun is the “Star of the show” in our world, so God intended people to look to JESUS as the Star of His panoramic show. 1 The heavens declare the glory of God; the skies proclaim the work of his hands. 2 Day after day they pour forth speech; night after night they display knowledge. 3 There is no speech or language where their voice is not heard. 4 Their voice goes out into all the earth, their words to the ends of the world. In the heavens he has pitched a tent for the sun, 5 which is like a bridegroom coming forth from his pavilion, like a champion rejoicing to run his course. 6 It rises at one end of the heavens and makes its circuit to the other; nothing is hidden from its heat. 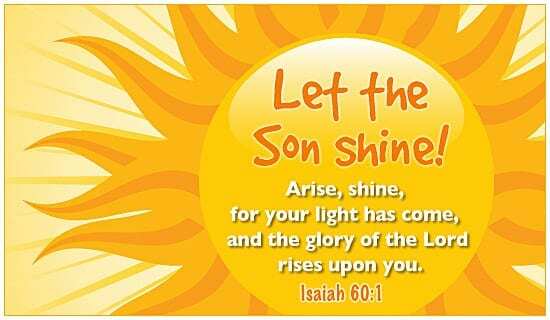 1 “Arise, shine, for your light has come, and the glory of the LORD rises upon you. 2 See, darkness covers the earth and thick darkness is over the peoples, but the LORD rises upon you and his glory appears over you. 3 Nations will come to your light, and kings to the brightness of your dawn. 1 “Surely the day is coming; it will burn like a furnace. All the arrogant and every evildoer will be stubble, and that day that is coming will set them on fire,” says the LORD Almighty. “Not a root or a branch will be left to them. 2 But for you who revere my name, the sun of righteousness will rise with healing in its wings [his garment borders]. And you will go out and leap like calves released from the stall. Clearly, the Creator wants all men to embrace the many relevant parallels He put in place between the celestial Sun and the Son of God, and act on these truths. No wonder that Satan, the master counterfeiter, has obscured that glorious truth from so many and even gotten them to worship the Sun instead of The Son. This is not the venue to detail the scientific truths about, or the countless benefits of, the Sun as it shines on Planet Earth and its denizens, but we will make a few observations that show the vivid parallels between the Sun and the Son. First of all, without the Sun, no life can exist on earth. Similarly, without the Son, there is no everlasting life on a new earth (John 14:6). The Sun is the ultimate source of power and energy. Likewise, Jesus is the power of God for the benefit of mankind (1 Cor. 1:24). The Sun benefits us in a number of ways. The Sun delivers heat, raising core body temperature. Higher core body temperatures facilitate increased cell function and higher energy. This increases our detoxification and purification systems. The Sun also regulates our natural biorhythm cycles. Boosted core temperatures increase cortisol levels during the day, ushering more relaxation and deeper sleep during the night. Just as plants photosynthesize nutrients from the Sun, our bodies need it for our own photosynthetic activities. Primarily from the Sun’s UVB rays our bodies synthesize vitamin D, which is necessary for healthy bones and teeth, and is also important for healthy immune function, nervous function and for insulin/blood sugar regulation, and numerous endocrine and digestive functions. Often the Sun is blocked from our view by clouds and rain, and there is nothing we can do about that. We know, however, that it is still shining, and if too many consecutive cloudy days cause you to doubt that, just buy an airline ticket to anywhere. Shortly after takeoff, you’ll break through the clouds and see your old pal shining as brightly as ever. As Christians, we can stop anything from getting between us and the Son. In fact, it is up to us (with his help) to remove any “veils” between him and us, walk in his freedom, and reflect his glory (2 Cor. 3:17 and 18). Furthermore, our Sun sets each day, bringing a period of darkness until the next morning’s sunrise. Not so with the Son, who shines on us day and night. For us, there’s no such thing as a Sonless day. Figuratively speaking, whenever we look up, we can see him. It is the Sun that enables us to see everything else clearly. If you ski, you know the stark difference between flying down a mountain on a gloomy day and on a sunny day. The absence of sunlight obscures the bumps and obstacles and increases your chances of falling, but a bright Sun shows you every glistening lump of snow. Likewise, Sonlight helps you see and know what is going on around you, both good and bad. While negotiating life’s obstacles, always wear your Songlasses. 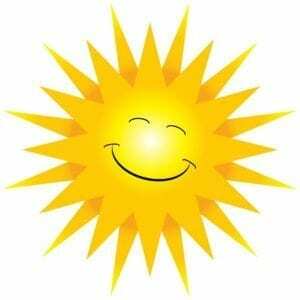 It is clear that how a person relates to the Sun determines whether it is healthful or harmful to him. The Sun gives life to those who relate to it properly, but it will eventually destroy those who do not. Likewise, Jesus Christ is the Rock who is our firm foundation, but that same Rock will one day crush those who oppose him. Not all of God’s plan of redemption for mankind is set forth in His celestial message, and that is because He could not reveal even a hint of the”Sacred Secret” until after Jesus Christ had gone the distance for us and conquered death. The basic truths in Genesis through Malachi and in the book of Revelation are emblazoned across the heavens, but there is nothing about the Body of Christ, by which Jesus would diversify himself around the world. No, God left that message for you and me to proclaim as living epistles. 14 Do everything without complaining or arguing, 15 so that you may become blameless and pure, children of God without fault in a crooked and depraved generation, in which you shine like stars in the universe 16a as you hold out the word of life. To hear teaching CLICK HERE. The epistle to the Colossians addresses the doctrinal deviation by those believers away from the magnificent revelation of Ephesians. The key phrase in Colossians that capsulizes their error is found in 2:19 (KJV): “not holding the Head.” A headless body is ineffective, at best, so each of us must do whatever it takes to maintain an intimate connection with our Head, the Lord Jesus. How intimate is your relationship with him? One more very cool point: Sunlight shining through a magnifying glass can start a raging conflagration. Jesus is our Sonlight, and we are to magnify him and thus light a fire in the hearts of those in our world. Perhaps we who stand for the biblical Truth about Jesus Christ and have a Sonny disposition can kindle a blaze in millions of people to the end that their hearts burn within them like those Jesus touched when he walked this earth. What else is there to do? In closing, I hope to run this glorious Sun/Son metaphor so far into the ground that from now on you’ll always think of JESUS, the Star of the Show, whenever you see the Sun. But for God’s sake, don’t stare at it, as that will cause you to go blind. In contrast, staring at the Son will help you see everything more clearly (Heb. 12:2). And the Son will beam back at you. We each took a Sonbath at the moment of our New Birth when Jesus baptized us with holy spirit. If we soak up the Son by Sonning ourselves (without Sonblock or Sonscreen), and get enough Son, we’ll be Sonkissed. The only Sonstroke we’ll get is his gentle touch, and any Sonburn will be him ridding our hearts of chaff. When we walk with The Son, our lives can be a series of Son-bursts. Here Comes the Son, which is great because Sonshine On My Shoulder Makes Me Happy. 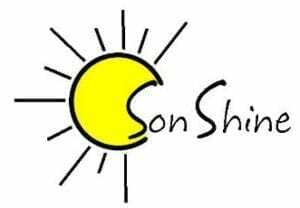 In fact, I Live For The Son, especially Everyday Sonshine. That’s why I always look for A Place In The Son where I can Let the Sonshine In and feel The Warmth Of The Son. I’m Walkin’ On Sonshine, because Jesus, You Are The Sonshine of My Life. And one of these days, We’ll Sing in the Sonshine: “Son, Son, Son, here he comes!” See you there, in the air.